The extant legal framework pertaining to bankruptcy and insolvency in India comprises several statutes. The 2018 World Bank report on Doing Business ranks India as 103 out of 190 countries on resolving insolvency up from 136 in 2017.2 The report also notes that resolving insolvency takes about 4.3 years and costs 9 per cent of the debtor's estate with the most likely outcome being a piecemeal sale of assets. The average recovery is 26.4 cents per dollar. Notably, the strength of insolvency framework index has increased from six in 2017 to 8.5 in 2018. In October 2014, the Ministry of Finance established the Bankruptcy Law Reforms Committee (BLRC) to review the law and suggest improvements. The BLRC's report resulted in the Insolvency and Bankruptcy Code 2016 (Insolvency Code) approved by Parliament on 12 May 2016. Over the past 12–24 months the Insolvency Code has been brought into effect. In June 2018, an ordinance amending the Insolvency Code (Insolvency Ordinance) was notified, inter alia, to address certain issues on which there had been significant litigation and divergent rulings. The Companies Act 1956 addressed, inter alia, insolvency of companies. The Companies Act 2013 repealed, in stages, the Companies Act 1956 and also addressed insolvency. The Insolvency Code was approved by parliament in 2016 and brought into force over 2016–2017. At present, the Insolvency Code addresses insolvency, creditors' winding up as well as voluntary winding up,4 of entities other than those engaged in the financial and securities markets5 (Financial Sector Entities) with a separate statute being contemplated to address the insolvency of Financial Sector Entities. The staggered implementation and repeal of the statutes concerned has resulted in some ambiguity as to the status of proceedings instituted under the Companies Act 1956, which remain to be resolved. However, the Insolvency Code stands as a complete code addressing insolvency save for Financial Sector Entities. The Insolvency Code applies to companies, limited liability partnerships (LLPs), partnership firms and individuals. The Insolvency Code first provides an insolvency resolution process and, if resolution fails, liquidation. Separate procedures have been detailed for corporate persons (i.e., companies and LLPs) and for partnership firms and individuals. The Insolvency Code also provides for insolvency professionals, to be registered under the Insolvency Code, who shall be responsible for implementing the resolution and liquidation processes stipulated under the Insolvency Code. The Banking Regulation (Amendment) Ordinance, 2017 of 5 May 2017 (the Ordinance) empowers the central government to authorise the Reserve Bank of India (RBI) to direct banking companies to initiate the insolvency resolution process provided in the Insolvency Code in cases of defaults. Pursuant to the Ordinance, an internal advisory committee was constituted by the RBI to recommend parameters based on which individual accounts were to be referred for resolution. It was recommended that all accounts with aggregate outstanding exposure in excess of 50 trillion rupees where at least 60 per cent of such exposure was classified as non-performing assets (NPAs) by the banks be referred to resolution under the Insolvency Code. The central government6 clarified that the RBI has directed banks to refer 12 accounts meeting the recommended parameters for resolution under the Insolvency Code. For accounts not satisfying the prescribed parameters, banks have been directed to finalise a viable resolution plan within six months failing to which the account will be referred for resolution under the Insolvency Code. The constitutionality of the press release was challenged before the Gujarat High Court by Essar Steel India Pvt Ltd (Essar), which was one of the 12 identified accounts, inter alia, on the ground that it violated Article 14 of the Constitution of India7 and was an ultra vires exercise of power by the RBI. Essar contended that there was no reasonable basis for classification of the accounts and that the differentia used for such classification had no nexus to the intended objective of dealing with stressed assets. Essar also contended that the economic state of the steel industry in India should also have been considered before subjecting them to insolvency proceedings. The Gujarat High Court dismissed the petition and upheld the constitutionality of the press release on the basis there can be no challenge to the reasonableness of the classification as the press release merely stipulated a time period for reference to the insolvency resolution process and made no practical classification. The court also ruled that issuing this press release was well within the powers of the RBI provided for by the Banking Regulation Act. While the Revised Framework retains some of the key principles of the erstwhile RBI guidelines including early recognition of stress, centralised reporting of credit information, elective right of lenders to convert outstanding balances into equity of the borrower, etc., the resolution mechanism has been significantly revised for consistency with the Insolvency Code inter alia by requiring lenders to mandatorily refer stressed accounts for resolution under the Insolvency Code under certain defined circumstances. All lenders subject to the Revised Framework must adopt policies for timely resolution of stressed assets under the Revised Framework. Immediately on the occurrence of default with respect to any lender, all lenders to that borrower must take steps to cure that default and implement a Resolution Plan. Lenders have the fullest liberty to implement a Resolution Plan provided that credit rating agencies issue a satisfactory credit opinion with respect to the debt which will continue outstanding in terms of the Resolution Plan. A Resolution Plan must be implemented within 180 days of the day of the first default and will be considered to have been so implemented when the account is no longer in default or, where the Resolution Plan requires Restructuring, where that Restructuring is appropriately documented and perfected by reflection in the accounts of all parties concerned. In July 2018, 24 major Indian lenders, including public sector banks, signed an intercreditor agreement for faster resolution of stressed assets in the 500 million rupees to 5 billion rupees range in consortium lending. This is likely to expedite the resolution process. Lenders are compelled to file reference before the IBC in two circumstances: (1) they are unable to agree the Resolution Plan within the 180 day timeline (including, pertinently if implicitly, the opinion of the credit rating agency(ies) is that residual debt is classified below RP 4); or (2) a Resolution Plan is implanted but the borrower defaults within the 'specified period'. Clearly, once reference is so made the Insolvency Code will require that efforts be made to effect a resolution in terms of the Insolvency Code and that will result in further delay with concomitant deterioration of security as well as a Lender accepting a Resolution Plan which does not meet the credit rating requirements prescribed by the Revised Framework. Clearly, this is of greater relevance to the scenario described at (1) above. In essence, the consequence of failure to agree a Resolution Plan may well result in an untrammelled abnegation of the RBI's intent in ensuring a healthy book with Indian banks and result in measures that are suboptimal as compared to the standards set out in the Revised Framework. the route to resolution: the Insolvency Code. 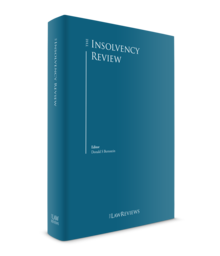 As set out in Section I.i, the Insolvency Code sets out a two-stage process: an insolvency resolution process; and in the event that such resolution process is unsuccessful, a liquidation or bankruptcy process as the case may be. Separate procedures have been detailed for corporate persons (i.e., companies and LLPs) and for individuals. For corporate persons, the insolvency resolution process may be initiated by a creditor. The Insolvency Code distinguishes between 'operational creditors'9 and 'financial creditors'.10 An application for resolution may be preferred by any creditor or group of creditors or by the company itself. The application is submitted to the adjudicating authority, which will admit the application if appropriate. Where an application is made by a financial creditor to initiate the insolvency resolution process,11 there is no express stipulation providing the debtor with an opportunity of being heard. an interim insolvency professional takes charge of the company. Homebuyers with advances to builders undergoing the insolvency resolution process have been elevated to the status of financial creditors by the Insolvency Ordinance. The interim insolvency professional16 manages the company and, inter alia, constitutes a committee of creditors and formulates an information memorandum as to the prospects of the company.17 A resolution plan is drafted based on the information memorandum and must provide for, inter alia, repayment of debts and management of the company. The resolution plan, if then to be approved by 75 per cent of creditors,18 is submitted to the adjudicating authority. The adjudicating authority approves or rejects the resolution plan. The entire resolution process is to be completed within 180 days and only one extension of up to 90 days to such timeline may be provided by the adjudicating authority. The Supreme Court recently19 upheld the right of the parties to arrive at a settlement and record consent terms after an application for initiation of the insolvency resolution process under Section 7 of the Insolvency Code was admitted by the adjudicating authority. The Supreme Court also upheld the decision of the National Company Law Appellate Tribunal (NCLAT) to disallow a compromise by the parties after the admission of the application while doing so by invoking its inherent jurisdiction and taking into account the fact that all parties were present before it. The position has now been settled by the Insolvency Ordinance, which provides that the NCLT may permit the withdrawal of an application for initiation of the insolvency resolution process filed by a financial creditor, an operational creditor or the corporate debtor with the approval of 90 per cent or more of the committee of creditors. Although jurisprudence under the Insolvency Code is nascent, some issues that have already resulted in significant litigation are the meaning of 'dispute' at Section 8 of the Insolvency Code as well as the subject of the moratorium protecting the debtor once an application for insolvency has been admitted. The Insolvency Code20 permits an operational creditor to file an application with the adjudicating authority for initiation of the insolvency resolution process 10 days after a demand notice is served and the corporate debtor has not: (1) made payment of the underlying debt; or (2) issued a notice21 informing the operational debtor of the existence of a dispute in relation to the underlying debt for which the demand notice has been served. While the position remained in flux, the Supreme Court in September 201725 considered the issue and, inter alia, held that the adjudicating authority need not examine whether the dispute is 'bona fide' or whether formal dispute resolution has been invoked in respect of the dispute but must instead only consider the following: (1) there is a plausible contention which requires further investigation; (2) a dispute truly exists in fact and is not spurious, hypothetical, illusory, mere bluster, plainly frivolous or vexatious; and (3) the dispute raised by the corporate debtor should be 'in existence' (i.e., real as opposed to frivolous or illusory). The Supreme Court also held that the adjudicating authority must not consider: (1) whether the dispute is likely to succeed; nor (2) the merits of the dispute except to the extent of it being patently feeble legal argument or an assertion of fact unsupported by evidence. The Insolvency Code provides for a moratorium to the corporate debtor during the pendency of the insolvency resolution process. Effectively, recovery actions by the creditors of the corporate debtor including under SARFAESI is prohibited in order to prevent hindrances to the resolution process. However, there seems to be conflicting views arising with respect to the scope and extent of the properties covered by the moratorium. However, the same bench, on a different occasion,28 held that a moratorium, if granted, would extend to personal properties of the promoters and directors of the corporate debtor. The position was clarified by the Insolvency Ordinance which has amended by the relevant provisions of the Insolvency Code to provide that the moratorium will not be applicable to a surety in a contract of guarantee. Accordingly, the extant position seems to be that the scope of the moratorium is limited only to the assets of the corporate debtor. The issue is particularly significant in the Indian context, where personal guarantees from promoters and directors as well as creation of security over their assets for corporate borrowers are common. Further to certain amendments made to rules governing the insolvency resolution process liquidators are now authorised to undertake strategic sale of the assets of the corporate debtor in parcels as well as collectively. However, presently, a timeline of 105 days has been prescribed within which the liquidator is required to identify applicants for the sale. While the intent is to complete the sale process within the 180-day period prescribed for the resolution process, it may be difficult to meet with the prescribed timeline especially in large insolvency proceedings where there are significant assets involved. Thereafter, the liquidator will apply to the adjudicating authority for a dissolution order in respect of the debtor. In liquidation proceedings, a secured creditor may opt to either realise his or her security interest or relinquish it, in accordance with the provisions of the Insolvency Code. The moratorium during the resolution process precludes the exercise of this right at that time, and such enforcement is possible only if the resolution plan fails or is rejected by the adjudicating authority, both of which lead to the commencement of liquidation proceedings under the Code. Dissenting creditors (i.e., those who vote against the resolution plan) are nonetheless bound by that plan if it is duly approved. The Insolvency Code provides for three mechanisms: the fresh start process, the insolvency resolution process and the bankruptcy process. On 14 June 2017, the Insolvency and Bankruptcy Board of India (Fast Track Insolvency Resolution Process for Corporate Persons) Regulations, 2017 were notified providing for fast track insolvency resolution for small companies. The fast track resolution process is to be completed within 90 days, as opposed to 180 days prescribed for non-fast track proceedings, and this time period can be extended by the adjudicating authority by up to 45 days. The Insolvency Code provides that the NCLT is the adjudicating authority for matters pertaining to companies and LLPs, while appellate jurisdiction is exercised by the NCLAT. As far as concerns individuals and unlimited partnerships, the adjudicating authority is the Debt Recovery Tribunal (DRT), while appellate jurisdiction is exercised by the Debts Recovery Appellate Tribunal (DRAT). Appeals against orders passed by the NCLAT and the DRAT will lie before the Supreme Court. As per the relevant stipulations set out in the Insolvency Code, control of insolvency proceedings, once initiated, shall lie with the relevant adjudicating authority and the appellate authority. Once initiated, the board of directors has no significant role in or control over the insolvency proceedings. The Insolvency Code permits the government to stipulate a separate framework regulating insolvency for financial services firms and such a framework is being proposed. The promulgation of this framework is expected in due course. Presently, the banking sector in India is faced with a large number of NPAs and stressed accounts. The Financial Stability Report released by the RBI on 26 June 2018 estimates that the gross NPAs of scheduled commercial banks in India increased by 1.4 per cent from 10.2 per cent in September 2017 to 11.6 per cent in March 2018 and that this ratio may further increase to 12.2 per cent by March 2019. The power industry was identified as having the largest debt with negative profitability at the end of March 2018 with telecoms, transport, construction, textile and iron and steel industries also identified as suffering from high leverage and interest burden. According to a written reply made by the Minister of State for Finance in Parliament in December 2018, the NPAs in the banking sector amount to approximately to 400 billion rupees, while CRISIL, one of the leading credit rating agencies India, in a report released in June 2018 observed that aggregate NPAs in the Indian economy stood at 10,300 billion rupees as of 31 March 2018. CRISIL also noted that additional large exposure corporate accounts amounting to approximately 5,000 billion rupees slipped into the NPA category in the 2018 fiscal year alone taking aggregate slippages in the previous three fiscal years to 13,600 billion rupees. In July 2017, CRISIL released a report suggesting that banks will have to take a haircut of approximately 2.4 trillion rupees to resolve the top 50 NPA accounts in the economy. In October 2017 the central government announced a 2,100 billion rupee bailout plan for public sector banks in the country in an attempt to resolve the high level of bad debt and to improve their capital position. While the announcement was generally well received by stakeholders including investors, in our view, it remains to be seen whether this will suffice to effectively and conclusively address the NPA issue in the long term. In some cases, adverse business circumstances with respect to certain specific sectors, for example, iron and steel, may be identified as having contributed to this predicament. However, issues relating to mismanagement of borrower entities as well as lack of sound and proactive lending and recovery policies on the part of the lenders are equally responsible. The RBI has, in the past few years brought about various schemes aimed at addressing the issue of NPAs and stressed assets. While these schemes have succeeded in providing stakeholders with multiple alternatives to deal with NPAs and stressed assets, in our view, the inconsistencies and overlapping of regimes with other statutory frameworks have somewhat hampered their effectiveness, especially in the context of resolution and restructuring. The Insolvency Code, once operative, is expected to redress these inconsistencies. As far as concerns lenders' recovery, there is presently a serious issue as to the timelines involved to achieve recovery. The Security Bill, in its statement of objects and reasons, points out that there are at present approximately 70,000 cases pending before the various DRTs pertaining to recovery. While there is an appreciable shortfall in terms of existing resolution infrastructure, the lack of cogent and coherent procedural stipulations in the regulatory framework has also contributed significantly to this issue. However, the Security Bill, passed by Parliament on 9 August 2016, seeks to ensure expeditious resolution of cases involving enforcement of security interest. The resolution process that has been made available under the Insolvency Code is plenary in the sense that it requires consent from the majority of all persons concerned. The RBI regulations are, necessarily, lender-centric. Voluntary winding up is a plenary process. There have been no significant recent or pending ancillary insolvency proceedings in India in the past year. While discussing recent trends with respect to insolvency proceedings at Indian law, the ongoing proceedings in relation to the Kingfisher Airlines Limited (Kingfisher) bankruptcy controversy is relevant. Vijay Mallya is under investigation in connection with sums owed to a consortium of lenders led by the State Bank of India, amounting to approximately 90 billion rupees by Kingfisher. The consortium has initiated action under SARFAESI and taken physical possession of Kingfisher House, the headquarters of Kingfisher, valued at 1 billion rupees. United Breweries (Holdings) Limited (UB Holdings), the ultimate parent of Kingfisher, had provided corporate guarantees to secure contractual payments due from Kingfisher, inter alia, in connection with sale and maintenance of aircrafts and other operations. However, Kingfisher defaulted in making these payments in or around 2010 and 2011, and consequently, the corporate guarantees were invoked. UB Holdings in turn defaulted on the payments to be made consequent to the invocation of the corporate guarantees. Accordingly, several winding-up petitions were filed against UB Holdings between March and November 2012. While UB Holdings opposed the winding-up petitions, it simultaneously filed an application before the Karnataka High Court pursuant to Section 536(2) of the Companies Act 1956,41 for leave to sell certain shares held in its subsidiary United Spirits Limited (USL) to Diageo PLC (Diageo). The Karnataka High Court granted its leave and Diageo purchased shares of USL. Diageo acquired a 55 per cent stake in USL during the course of 2012 and 2013. However, in February 2016, Vijay Mallya was asked to step down from USL's board of directors, pursuant to an internal forensic audit enquiry, whereby various legal contraventions were discovered in relation to loans given by USL to the United Breweries Group companies. In April 2017, the RBI issued a notification advising banks to review and monitor their exposure to the telecommunications sector in view of the increased stressed levels in the sector and consider making provisions for standard assets in this sector at higher rates. The Insolvency Code is still in its early stages, and in the future, there may well be an increase in insolvency proceedings being initiated by the debtors themselves, since the Insolvency Code is geared primarily towards revival and rehabilitation of insolvents. The insolvency resolution process may be effective, especially where debtors are facing genuine stress on account of, inter alia, market conditions, unfavourable changes in regulatory policies, etc. The resolution process and the subsequent resolution plan (if implemented well) will allow stressed businesses to recover, and the extent of financial distress45 makes this a particularly relevant development for the Indian economy. 1 See Section 9(1) of the Insolvency and Bankruptcy Code, 2016. 2 See Section 7(1) of the Insolvency and Bankruptcy Code, 2016. 3 See Section 9 of the Insolvency and Bankruptcy Code, 2016. 4 See Explanation to Section 7(1) of the Insolvency and Bankruptcy Code, 2016. 5 See Section 9(4) of the Insolvency and Bankruptcy Code, 2016. 6 See Section 7(3) of the Insolvency and Bankruptcy Code, 2016. 7 See Section 21(2) of the Insolvency and Bankruptcy Code, 2016. 8 See Section 21(2) of the Insolvency and Bankruptcy Code, 2016. 9 See Section 24(3)(c) of the Insolvency and Bankruptcy Code, 2016. 10 See Section 24(3)(a) of the Insolvency and Bankruptcy Code, 2016. 11 See Section 24(4) of the Insolvency and Bankruptcy Code, 2016. 12 See Section 24(1) of the Insolvency and Bankruptcy Code, 2016. 13 See Section 24(4) of the Insolvency and Bankruptcy Code, 2016. 14 See Section 24(6) of the Insolvency and Bankruptcy Code, 2016. 15 See Section 215(3) of the Insolvency and Bankruptcy Code, 2016. 16 See Section 215(2) of the Insolvency and Bankruptcy Code, 2016. 17 See Section 76 of the Insolvency and Bankruptcy Code, 2016. 18 See Section 75 of the Insolvency and Bankruptcy Code, 2016. 1 Justin Bharucha is a partner at Bharucha & Partners. 3 The Presidency Towns Insolvency Act 1909 and the Provincial Insolvency Act 1920 stand repealed. 4 That is, a winding up instituted and enforced by creditors that is now addressed by, inter alia, Sections 6, 7, 8, 9, 33 and the Insolvency and Bankruptcy Board of India (Insolvency Resolution Process for Corporate Persons) Regulations, 2016 and the Insolvency and Bankruptcy Board of India (Liquidation Process) Regulations, 2016. Voluntary winding up of a company is addressed by, inter alia, Section 59 of the Insolvency Code and the Insolvency and Bankruptcy Board of India (Voluntary Liquidation Process) Regulations, 2017. 5 In terms of Section 3(7) of the Insolvency Code, the Insolvency Code does not apply to financial service providers who have been specifically excluded from the definition of 'corporate persons'. A financial service provider is defined under the Insolvency Code as 'a person engaged in the business of providing financial services in terms of authorisation issued or registration granted by a financial sector regulator'. 6 Press release dated 18 July 2017. 7 Article 14 mandates equality before the law and prohibits arbitrary action by the state. It follows that when the state categorises citizens (including corporate entities) the proposed classification is to be founded on intelligible differentia that must bear a rational nexus to the intended object of such classification. 8 The RBI has previously promulgated several schemes for resolution of stressed assets including, inter alia, the corporate debt restructuring scheme, strategic debt restructuring scheme, sustainable structuring of stressed assets, joint lenders forum, etc. 9 A person to whom an operational debt is owed and includes any person to whom such debt has been legally assigned or transferred. The Insolvency Code defines an operational debt as a claim in respect of the provision of goods or services, including employment or a debt in respect of the repayment of dues arising under any law for the time being in force and payable to the central government, any state government or any local authority. 10 A person to whom a financial debt is owed and includes a person to whom such debt has been legally assigned or transferred. The Insolvency Code defines a financial debt as a debt along with interest, if any, that is disbursed against the consideration for the time value of money and includes: (1) money borrowed against the payment of interest; (2) any amount raised by acceptance under any acceptance credit facility or its dematerialised equivalent; (3) any amount raised pursuant to any note purchase facility or the issue of bonds, notes, debentures, loan stock or any similar instrument; (4) the amount of any liability in respect of any lease or hire purchase contract that is deemed as a finance or capital lease under the Indian Accounting Standards or such other accounting standards as may be prescribed; (5) receivables sold or discounted other than any receivables sold on non-recourse basis; (6) any amount raised under any other transaction, including any forward sale or purchase agreement, having the commercial effect of a borrowing; (7) any derivative transaction entered into in connection with protection against or benefit from fluctuation in any rate or price and for calculating the value of any derivative transaction, only the market value of such transaction shall be taken into account; (8) any counter-indemnity obligation in respect of a guarantee, indemnity, bond, documentary letter of credit or any other instrument issued by a bank or financial institution; and (9) the amount of any liability in respect of any of the guarantee or indemnity for any of the items referred to in (1) to (8) above. The different rights of operational and financial creditors are set out at Annexure I (Rights of Operation and Financial Creditors). 11 In terms of Section 7 of the Insolvency Code. 12 The right of a party to present its case is an essential ingredient of natural justice at Indian law. Illustratively, see Union of India v. Shiv Raj (2014) 6 SCC 564. 13 Writ Petition 7144(W) of 2017, Sree Metaliks Limited and another v. Union of India and Anr. 14 In terms of Section 8 of the Insolvency Code. 15 The scope and meaning of the term 'dispute' has been subject to litigation. See 'Existence of dispute'. 16 The committee of creditors may either confirm the appointment of the interim insolvency professional or replace the interim insolvency professional with a different insolvency professional. 17 Members of the suspended board of directors or the partners of the corporate person, as well as operational creditors (if the amount of their aggregate dues is not less than 10 per cent of the debt) are entitled to attend the meetings of the committee of creditors; however, they cannot vote at such meetings. 18 A creditor's vote is determined pro rata to that creditor's share of the total debt of the company. Note that debt is classified as 'operating debt' and 'financial debt' and the creditor's pro rata share is calculated based on this classification. 19 Lokhandwala Kataria Construction Private Limited v. Nisus Finance and Investment Managers LLP, Civil Appeal No. 9279 of 2017. 20 In terms of Section 9 of the Insolvency Code. 21 In terms of Section 8(2) of the Insolvency Code. 22 DF Deutsche Forfait AG and Anr v. Uttam Galva Steel Ltd; R.L. Steel & Energy Ltd v. Shyam Industries Ltd; Vertex Chemicals v. Mahaan Proteins Limited; Pheonix Global DMCC v. A&A International Trading Private Ltd; Surbhi Body Products and Godolo and Godolo Exports Pvt Ltd v. Meyer Apparel Ltd.
23 KirusaSoftware Ltd v. Mobilox Innovations Pvt Ltd, NCLAT Company Appeal (AT) (Insolvency) 6 of 2017; Surbhi Body Products and Godolo and Godolo Exports Pvt Ltd v. Meyer Apparel Ltd; One Coat Plaster and Shivam Construction Company v. Ambience Pvt Ltd; Philips India limited v. Goodwill Hospital & Research Centre Limited; PK Ores v. Tractors India Private Limited; MCL Global Steel Pvt Ltd v. Essar Projects India Ltd.
24 Annapurna Infrastructure Pvt Ltd & Ors v. Soril Infra Resources Ltd.
25 Mobilox Innovations Private Limited vs Kirusa Software Private Limited AIR 2017 SC 4532. 26 Alpha and Omega Diagnostices (India) Ltd v. Asset Reconstruction Company of India Ltd.
27 Sandria D'Souza and others v. Elektrans Shipping. 28 Leo Duct Engineers & Consultants. 29 Reliance Commercial Finance Ltd v. Anil Ltd 2017 143 SCL 501 NCLT (Ahd). 30 EXIM Bank of India v. CHL Ltd 2018 146 SCL 43. 31 Indian Overseas Bank v. RP for Amtek Auto Ltd 2018 145 SCL 138 (NCLAT). 32 Nitin Parikh v. Madhya Gujarat Vij Company Ltd 2018 146 (SCL) 412 (NCLT – Ahmedabad). 33 JAS Telecom Pvt Ltd v. Eolane Electronics Bangalore Pvt Ltd – 2018 144 CLA 89 (NCLAT). 34 Section 53 of the Insolvency Code. 35 Section 52 of the Insolvency Code. 36 The eligibility criteria includes, inter alia, a gross annual income not exceeding 60,000 rupees; no ownership of a dwelling unit; and the aggregate value of assets should not exceed 20,000 rupees. 37 Illustratively, for the Startup India programme, thus far out of 728 applications for start-up recognition, 180 are recognised as start-ups; however, only 16 of these have been incorporated post 1 April 2016 and are therefore eligible for tax benefits. See www.thehindubusinessline.com/info-tech/16-startups-considered-for-benefits-under-finance-act/article8876630.ece. 38 Sections 234 and 235 of the Insolvency Code. 39 Section 18 of the Insolvency Code. 40 Section 36 of the Insolvency Code. 41 Section 536(2) of the Companies Act 1956 states, inter alia, that any transfer of shares in the company or alteration in the status of its members made after the commencement of the winding up, shall, unless the court otherwise orders, be void. 42 See (i) https://www.livemint.com/Companies/d7F8krFiKqQpowIq0VuAAI/Vijay-Mallya-Fugitive-Economic-Offenders-Ordinance-Bill.html; and (ii) https://www.livemint.com/Companies/ziJDYY7YPtbDUwJf7wHwmM/Vijay-Mallya-willing-to-return-to-India-as-ED-moves-to-sei.html. 43 See Section VI for a brief description of the Fugitive Economic Offenders Ordinance, 2018. 45 Measured in terms of stressed and non-performing assets on lenders' portfolios.